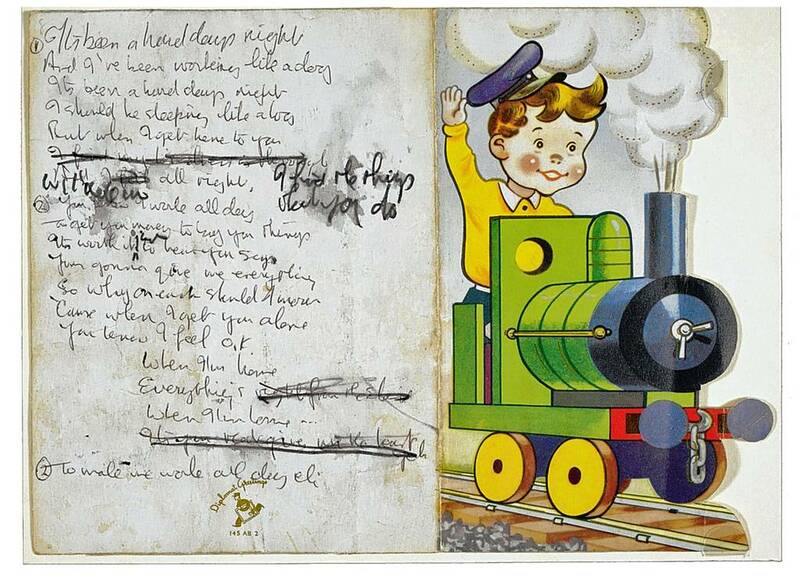 The original lyrics to “A Hard Day’s Night” were written by John Lennon on a birthday card for his son Julian. The card is now in the British Library, in the same room as the Magna Carta. The hacked Sony emails keep on giving, passing along some important news to Beatles’ fans. The emails, leaked to many places on the web, now reveal that Sony executives were thinking of selling the company’s investment in the Beatles’ classic song catalog, according to a recent story in the Wall Street Journal. Whether Sony is still considering the sale is an open question as the company has refused to comment. That catalog contains 251 Beatles early songs written by John Lennon and Paul McCartney. What’s at stake are the publishing rights of these songs which, some may be surprised to learn, are not owned by McCartney or John’s heir Yoko Ono. This collection is said to be worth between $1.2 and $2 billion dollars. To understand the full and complicated history of why those Beatles songs are NOT owned by the songwriters themselves, you’d need to read the book “Northern Songs” by Brian Southall. In 1985, the songs came up for sale and were brought by Michael Jackson after Sir Paul advised Jackson that buying up the publishing catalogs of classic rock songs was a very good investment indeed. Jackson paid ‘only’ $47 million. Sir Paul had discussed buying the songs with Yoko Ono but when they could not agree, Jackson swooped in and bought them himself. According to reports, Sir Paul has always been irked about that sale. After Jackson’s death, his estate sold 50% of the song rights to Sony, a bright spot in their holdings. Sir Paul has been quoted as saying that he’s not happy that every time he sings “Hey Jude” or many other of his classics, he has to to pay Sony and the Jackson estate. British tabloids have been speculating that Sir Paul may put together a group of money men to buy back his old songs but that has not been corroborated. Nor is it even a certainty that Sony will actually sell such a valuable asset that only promises to increase as time goes on.